That's me on the left, already in glasses and already dorky, with Barb (center) and Joan (right). Those cone things on the lower left are Bedrock Boulders. The printed cloth you see between Barb and Joan is a housecoat I received. Except for the humans, the only things in the picture that still exist are the Nativity set, the music box under the tree (that's the dark thing behind Barb), and, of all things, the aluminum ladder! My grandmother Matilda with my sister Joan, in her second outfit of the evening. I think the reason they are looking down is because it looks like Heidi lost a shoe. The TV thing you see on the left is a windup toy that played "Here We Go 'Round the Mulberry Bush." At some point we got ready for bed. Note that I am wearing the aforementioned housecoat. I remember all the toys in this picture except for the bell thing that Barb is playing. 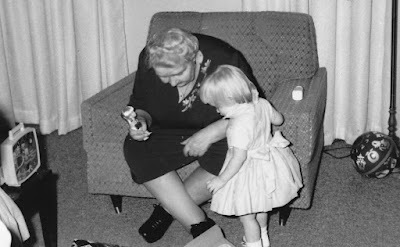 From left to right are a blackboard, Fisher-Price milk bottles (you can also see a bottle on the chair with Grandma), a ball, the bells and a roller coaster. 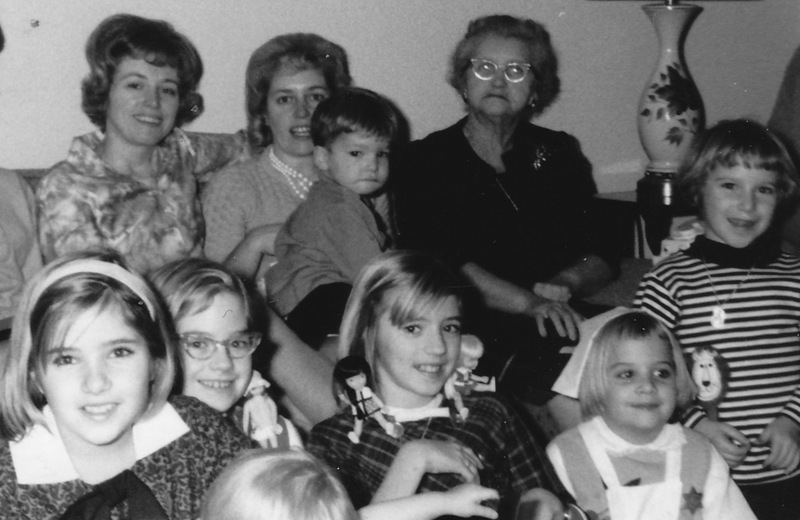 These are two aunts, my grandmother Loretta, a bunch of my cousins, and me. 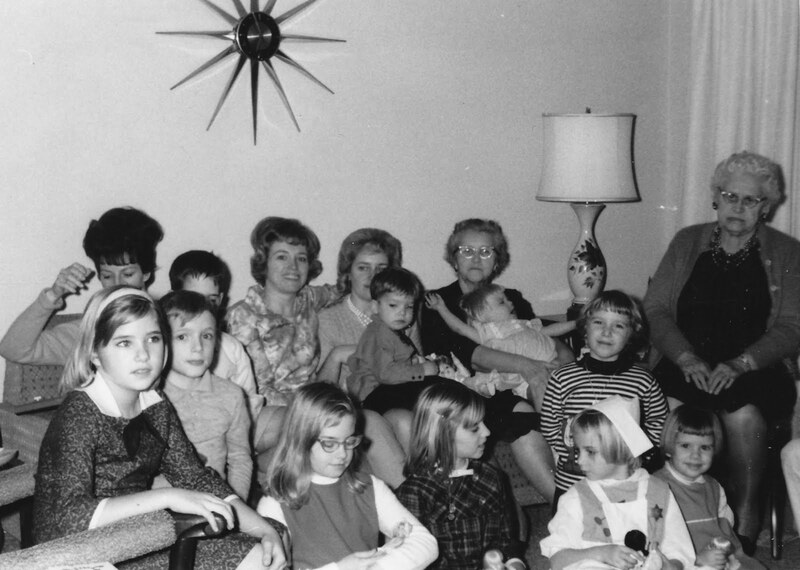 My cousin Jane Ann has my new Tutti while my cousin Cathy has Jan and Heidi propped on her shoulders. I am wearing a nurse's smock and hat that I received. 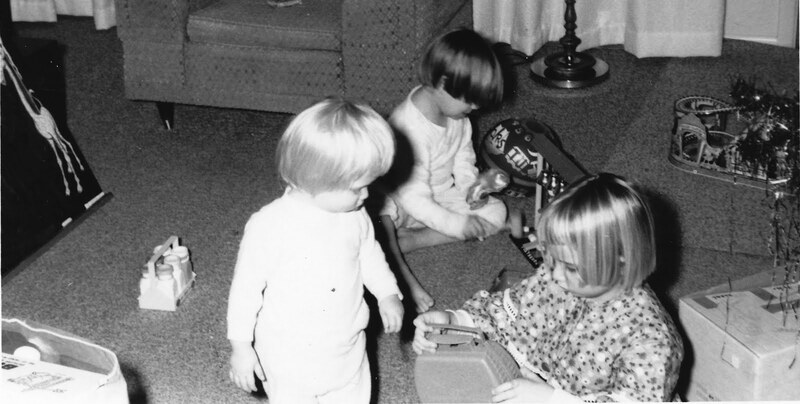 Look behind my cousin Nancy (in the striped shirt), for the Fisher-Price Chatter Phone, which I always thought was creepy. The phone, not Nancy! Another shot of Christmas Day evening (the infamous starburst clock says 6:55 p.m.). The only toy item that still exists is the Tutti swimsuit, as the doll herself is long gone. The other women in the back are an aunt and a great-aunt. My cousins Chris and Karen in the back do not look happy. I don't know what the baby doll is. I also don't know why I am wearing a Star of David pin, which is really strange because everyone in the picture is Catholic! Perhaps the pin came with the outfit? The item under my Aunt Loretta's arm on the far left is an Etch-a-Sketch. I've mentioned before that I never actually had Barbie as a child, although my sisters did. I had Barbie's friends and relatives, though. The first Barbie family member I received was Tutti, for Christmas 1966. I also received the Remco Jan doll while my sister Barb got Heidi. I have no idea why I, the oldest sister, was always getting the friends while my sisters got the main parts of the series. I was born in February 1961, so I was 5 at the time. 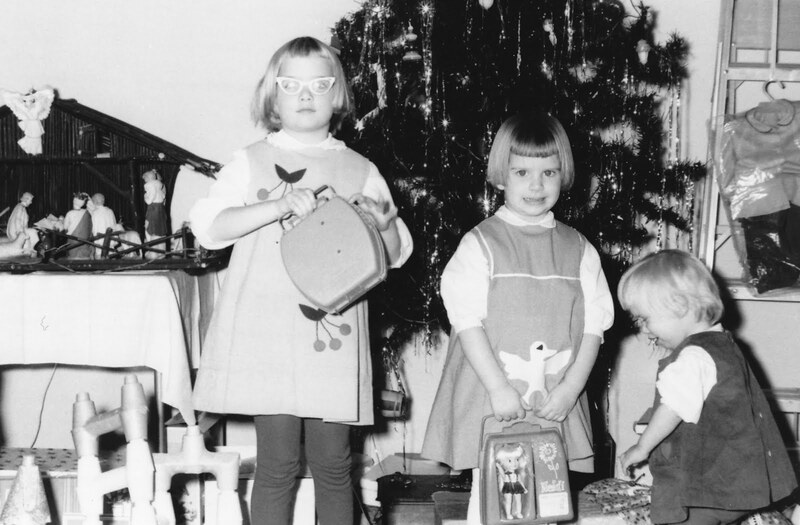 My sister Barb was 3 and my sister Joan was 1 1/2. These photos were taken on Christmas Eve and Christmas Day. I'm just going to show you the photos and include long captions with them.